I confess. I have a small obsession with mug toppers. It started with the marshmallow ones (like these Stuffed Chocolate Chip Marshmallow Mug Toppers) and grew to include cookies or anything adorable and sweet that works with a mug of steaming tea. I’ve seen quite a few gingerbread cookie mug toppers, including the little houses that Williams Sonoma is selling this Holiday season. But something has been bothering me about using a regular eating cookie as a mug topper when it has no reaction to the hot beverage. By reaction, I mean – gets tastier or actually complements the beverage. Marshmallows melt into your hot cocoa, creating a dessert drink. Stroopwafels turn into a gooey cookie, making them well…delicious. 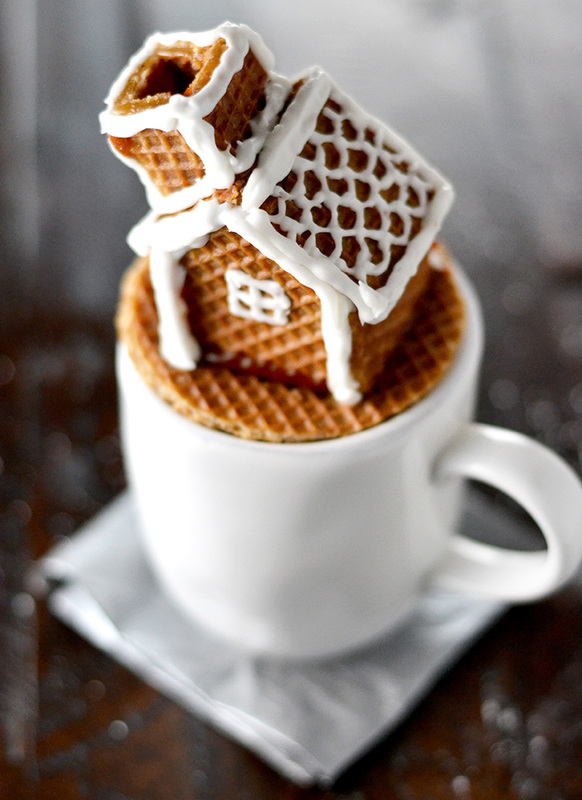 So I wanted to combine the two: charming gingerbread house meets functional made-for-hot beverage stroopwafels. With the encouragement of a few friends, I set out on this somewhat unfamiliar DIY journey. I had visions of collapsed soggy cookie houses, strings of burnt caramel, and frosting decoration horrors. To my pleasant surprise (and careful planning), this lovely creation went fairly smoothly. I only burnt the caramel once (feel free to use icing as the glue since it’s easier to work with – I chose caramel since the cookie already had a caramel center). Since you don’t have to bake the gingerbread first, these are much easier than gingerbread houses but just as festive. The best part is you can actually eat the house when you’re done (unlike a regular gingerbread house) and the sweet caramel layers pair perfectly with any hot holiday beverage. 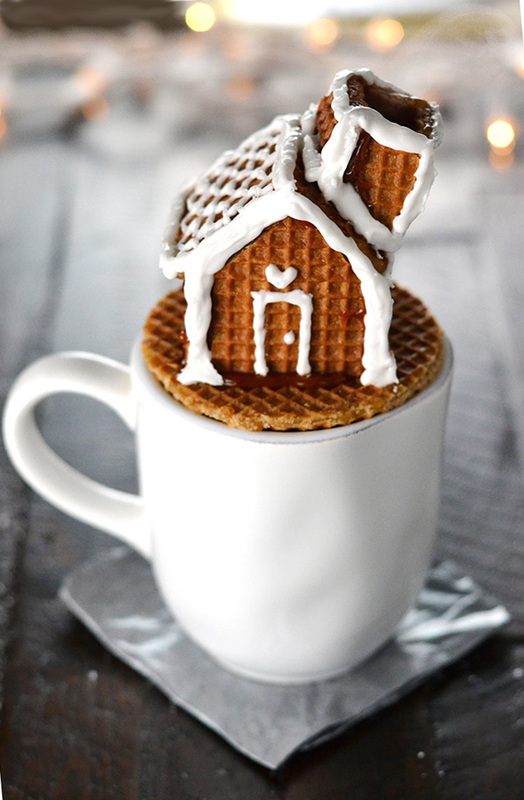 All the cuteness of a gingerbread house with all the texture and tastiness you want in a mug topper. Not to mention the working chimney sends the cute factor through the roof…literally. Note: To help provide clear assembly instructions, the below recipe yields just one house. It can easily be doubled or quadrupled. Two pieces for the front and back of house - 1 1/2” wide at the base, 1 1/8”to the roof edge, and slanted to a point 1 1/8” from base edge. Two smaller rectangles 1 1/2” x 1 1/4” for the roof – cut a square hole just under a 1/2” in the middle of one rectangle (similar to a doughnut hole), leaving the edges intact. 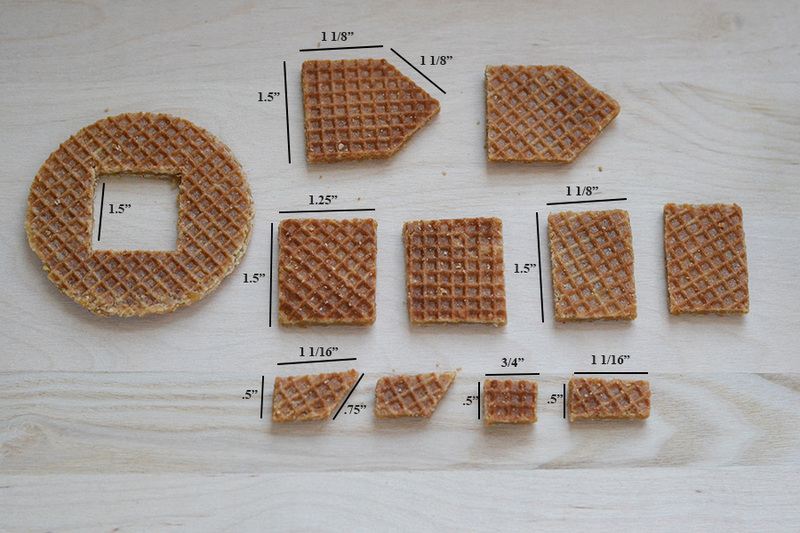 Using a sharp paring knife, use the patterns to cut each piece of the house from the stroop wafel cookies. For the base that holds the house, place the pattern in the center and cut around the pattern edge, almost like a doughnut hole. Make sure to leave a border/edge fully intact for the house to sit on. Heat sugar over medium heat until amber in color. Remove from heat and add 1 tablespoon of butter. 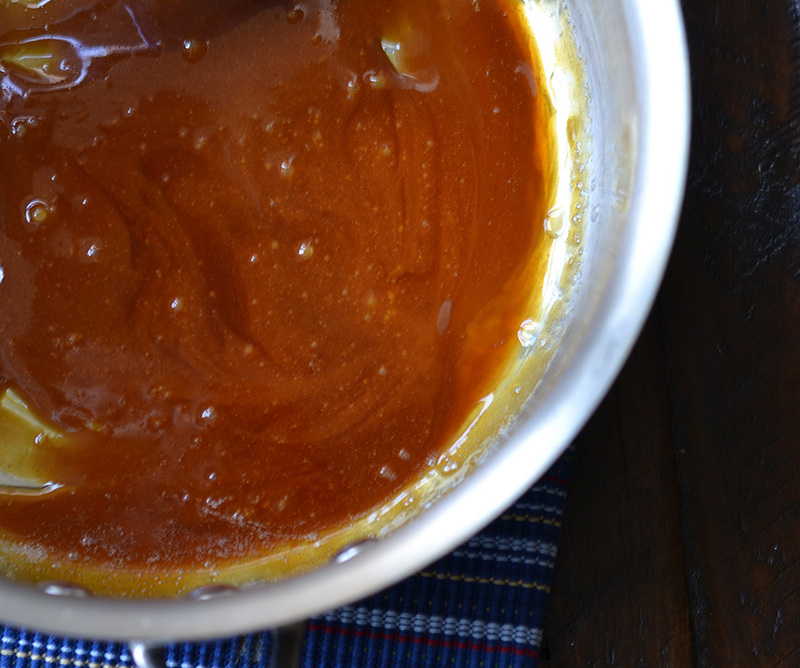 Keep the pot warm or near the stove to quickly heat if caramel hardens. Place one side of house on a flat surface. Using a small heat proof spatula or butter knife, spread a line of caramel on the short edges. Immediately, press the side edge of front of house piece parallel against one caramel lined side and side edge of back of house piece parallel against the other caramel lined edge. Hold for 2 minutes. Line the second side of house piece with caramel (just as you did the first). Press against the open edges (front and back of house edges), creating the foundation for the house. Hold for 2 minutes. Flip house foundation up so that it’s standing and no longer on its side. Spread a line of caramel on all 4 sides of one roof piece. Quickly press the roof piece onto the house, position so that the top edge aligns with tops of front and back sides of house. Hold for two minutes. Line the edges of the second roof piece and press against the house, positioning so that top edge aligns with edge of first rectangle. Place the long rectangle on a flat surface. Spread a line of caramel on the long edges. Immediately, press the long edge of one chimney side parallel against one caramel line and the long edge of the second chimney side parallel against the other caramel lined edge. Hold for 2 minutes. Line the sides of the back of the chimney piece with caramel and press against the open edges. Hold for 2 minutes. 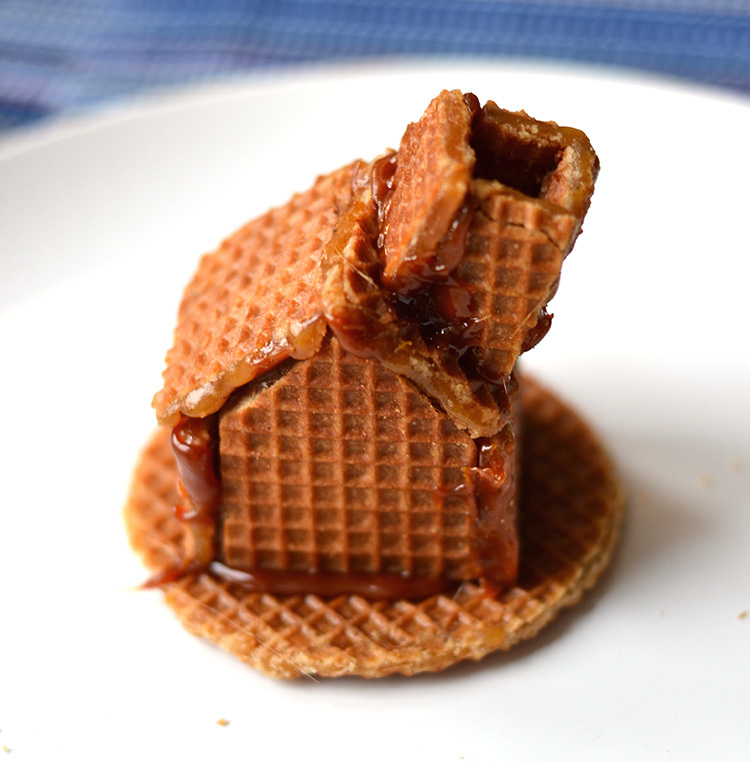 Dip the entire edge of the slanted bottom of the chimney in caramel and immediately place over the corresponding hole in the roof of the stroopwafel house. Hold for two minutes. Dip the entire four bottom edges of the house in caramel and immediately place over the square hole in the flat base cookie. Beat 1 ¾ cups powdered sugar and egg whites until and thick and shiny. Add lemon juice. Spoon icing into piping bag, plastic bag, or small parchment piping cone (click here for a video on how to make this). Decorate house as desired – pipe the edges of the house, create roof shingles, door, and even windows. Place the mug topper on top of a steaming cup of hot coffee, tea, or hot cocoa and watch the steam rise out of the chimney. Consume the gooey caramel treat once softened. Consume immediately (mug topper should not be left on hot beverage mug for more than 10-15 minutes as it may collapse…sink hole!). Awww, this looks so cute and fun! Well done, great idea for the holidays! Incredible! This is one the cutest and most original food ideas I’ve ever seen. Thank you so much for sharing Megan and Happy Holidays! They look too pretty to eat. These are really cute, I bet they are really yummy too. Now I want coffee! Hah. Happy holidays! I love these! These are such a cute idea. And the steam comes out the chimney (love). Pinning this for sure. I saw these on FoodGawker and thought they were so absolutely cute! I love this idea. Thanks so much for sharing!